Galley Wench Tales: Two Tickets to Paradise? “Paradise Island” is on the right. But a bridge away from Nassau, sits the site for two Bond flicks (click here to get your Bond audio grove going), “Casino Royale” and “Thunderball” -- Paradise Island. More Paradise Island star-studded trivia? “Survivor: All-Stars” contestants Rob Mariano and Amber Brkich were married here, on camera, of course. Indeed, Paradise Island’s sprawling mega-resort Atlantis is perfect for a glitzy movie set; it seems more surreal than real. 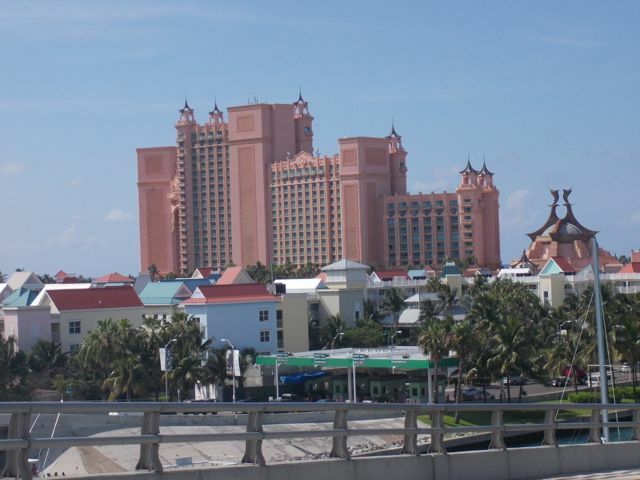 True retro splendor, Atlantis is the granddaddy of gargantuan Bahamian resorts; the country’s first large scale resort (history buffs, click here). 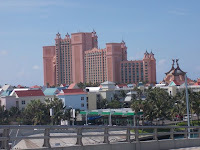 Staying in Atlantis’ marina is essentially the cruiser’s “E-ticket” for the island. 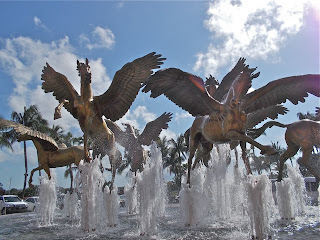 Swim with the seals (click here to see), dive with the dolphins (click here to see), serve stingrays their supper (click here to see), slide past sharks (click here to see), whoop it up in the waterpark (click here to see)…. It’s an aquatic Disney, a fancy fishbowl, where the animals are real, up close and personal. Of course, the marina costs a minimum of $200/night, too. If a tropical Vegas meets Disney is your idea of a great escape, Altantis is for you. As for us? We were just low-budget lookie-loos, as usual. We thought we might be able to check out one of the aquariums, slipping past there through the casino just before closing. No luck. No tickee, no lookie, even for lookie-loos like us. 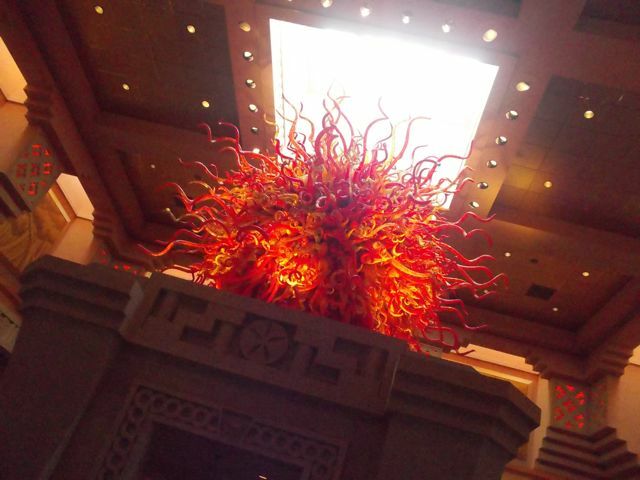 objects d'art abounding at Atlantis. We did consider slipping off for a rare splurge in Atlantis , to sleep one in “a real bed.” In fact, we’ve yet to sleep on a “real bed” together since August 2012. But wallets won over wistful wishes. Curious about what a “real bed” is for a Pearson cruiser (our by our definition, anyway)? More about that in a future post, soon. Note: This post is a retrospective. 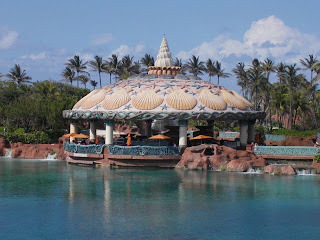 We were in Atlantis in May 2013, but didn’t blog about it then. As Tallulah Bankhead famously quipped, “Only good girls keep diaries. Bad girls don't have time.” Or, it would seem, decent internet. Whether I’m a “good girl” or not, well, opinions vary. at Atlantis isn't underwater, though it does "take the cake"
when it comes to over-the-top decor. 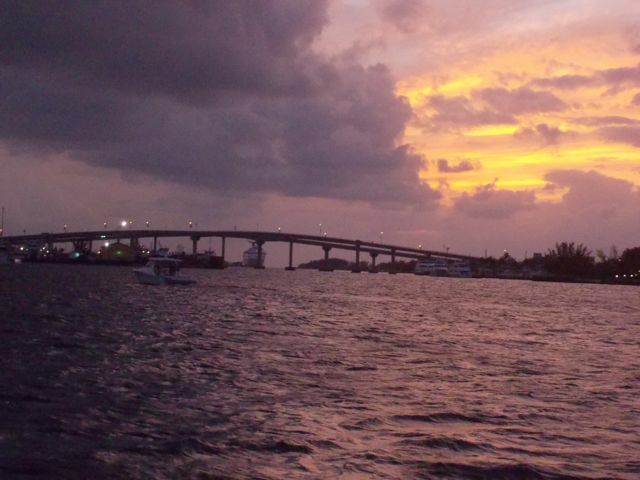 At the time of this post, we are in Jacksonville Florida busy re-establishing our cruising kitty and making purchases at West Marine with my associate discount. We plan to set sail in December.